Decal sheet and full colour instruction sheets in a resealable bag. Great variety; full colour instructions, perfect register and minimum carrier film. 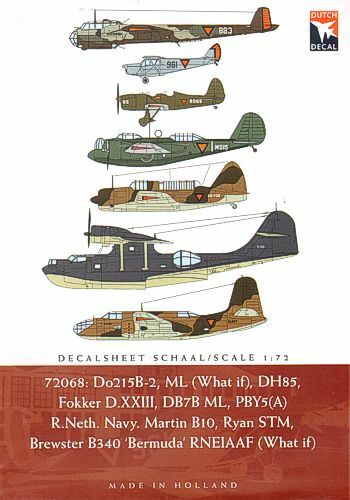 This is another excellent decal sheet produced by Dutch decals in 1/72 Scale depicting Royal Netherland Air Force Do215B-2, DH-85, Fokker D.XXIII, DB7B ML, PBY5(A), and Royal Netherland Navy Martin B10, Ryan STM, Brewster B340. The decals are superbly printed with good colour saturation and excellent register. As usual the carrier film is ultra thin and my experience with Dutch Decals that I have used in the past is that the decals will snuggle down into the surface detail well. I always use decal setting solution. The carrier film then almost totally disappears under a coat of clear. Dornier Do-215 B2 866 and 874, (first Serie). ML (Military Airforce). Strategische verkenner VerVa based at Bergen Air Base in 1940. The aircraft is finished in RLM 70/71/65 and had orange triangles in six positions and orange rudders. Dornier Do-215 B2 875 and 883, (Second Serie). ML (Military Airforce). Strategische verkenner VerVa based at Bergen Air Base in 1940. The aircraft is finished in RLM 70/71/65 and had orange triangles in six positions and orange rudders. Dornier Do-215 B2 866/874, (first Serie). ML (Military Airforce). Strategische verkenner VerVa based at Bergen Air Base in 1940. The aircraft is finished in fictional ML camouflage of Dark brown, green and light grey and had orange triangles in six positions and orange rudders. Dornier Do-215 B2 875/883, (second Serie). ML (Military Airforce). Strategische verkenner VerVa based at Bergen Air Base in 1940. The aircraft is finished in fictional ML camouflage of Dark brown, green and light grey and had orange triangles in six positions and orange rudders. PBY-5 Y-38 of the Royal Netherland Navy in 1941. The aircraft is finished in the delivery scheme of FS24583 Dark Blue Grey upper surfaces and FS 24583 milky white under surfaces. Large orange triangles were painted in six positions and orange rudders. PBY-5 Y-39 of the Royal Netherland Navybased in the Dutch East Indies in 1942. The aircraft is finished in the delivery scheme of FS24583 Dark Blue Grey upper surfaces and FS 24583 milky white under surfaces. Small orange triangles were painted in six positions and orange rudders. PBY-5 Y-75 of the Royal Netherland Navy based in Ceylon in 1943. The aircraft is finished in the delivery scheme of FS24583 Dark Blue Grey upper surfaces and FS 24583 milky white under surfaces. Large orange triangles were painted in six positions and orange rudders. Douglas DB-7B AL907 of the Royal Netherlands Navy based at Tjilitjab Air Base in the Dutch East Indies in 1942. The aircraft is finished in Dark Green and Dark Earth upper surfaces and Duck Egg Blue under surfaces. The aircraft has medium sized orange triangles painted on the lower wing surfaces and fuselage sides. Ryan STM-2 R065 of the RNEIAAF in 1942. The aircraft is finished in olive green upper surfaces and silver lower surfaces. Brewster B-340 BD-708 to BD 7162. 162 aircraft were ordered but not delivered. This fictional scheme is finished in Dark Green and Dark Earth upper surfaces and Duck Egg Blue under surfaces. 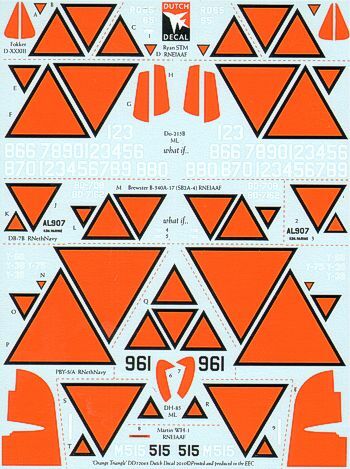 The aircraft has orange triangles painted in six positions. De Havilland DH-85 serial number 961 based at Soesterberg Air Base in 1940. The aircraft is finished in overall FS25189 Blauw. The aircraft has orange triangles painted in six positions with the rudder painted orange.